Since 1968, Constructions Casiano Tenza S.L. offer a full service in construction, promotion and real estate. 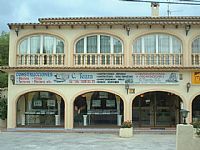 We are located on the Costa Blanca, in Calpe (Alicante). Our principal activity is building 1st quality villa. Along these years we built a full range houses using the latest technology and the best materials. Our experience, our professionally built the confidence of our clients. Building or purchasing with us, guarantee security and reliability, personal and professional administration of your property. We collaborate with all professional, as architects, aparejadores etc.... and together we try to facilitate the adquisition of your dreaming house. We have an important selection of plots and properties that we hope will be correspond on what your are looking for. If you did not find your house, we will be delighted to search it for you. We stay on your service for any doubt or comment. Our personal service on client can advise you with full professional guarantee !